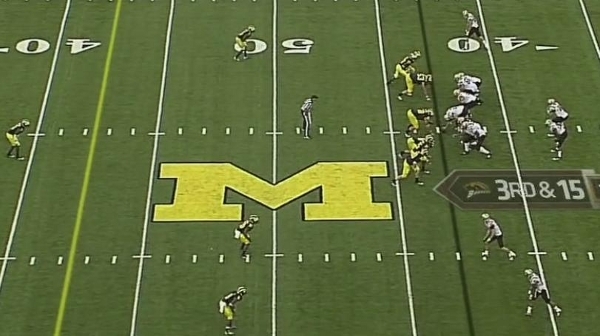 We've already seen two different instances where Greg Mattison uses stunts and zone blitzing to get a free shot at the opposing quarterback, but like any mad genius, Mattison has variations of those formations that return similarly devastating results. Last year, we saw this kind of tinkering from Rich Rodriguez's offensive staff, which was able to use the QB draw play action with Denard to free up wide receivers and make safeties forget their assignments. 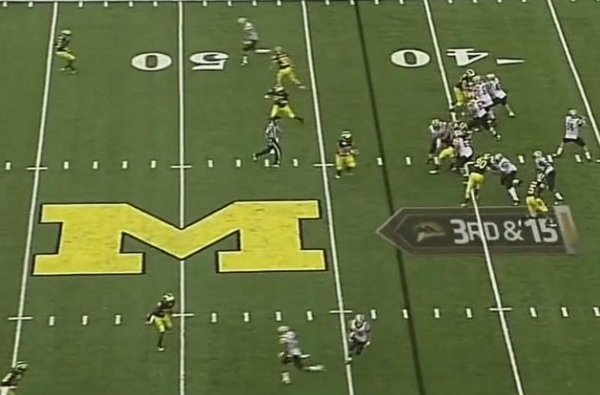 You probably already recognize the alignment below: Michigan is in a 3-4 set with all of the linebackers pushed to the line of scrimmage showing blitz. It's difficult to see here, but on the weakside of the play (top of the screen) Jordan Kovacs and Mike Jones are both lined up on the line of scrimmage just outside Ryan Van Bergen, who's playing WDE. On the strongside of the field, Kenny Demens and Jake Ryan are flanked outside of SDE Craig Roh. Ryan, Demens, and Roh will execute the exact same stunt blitz that we've seen twice previously. Mike Martin is lined up as the nose tackle. 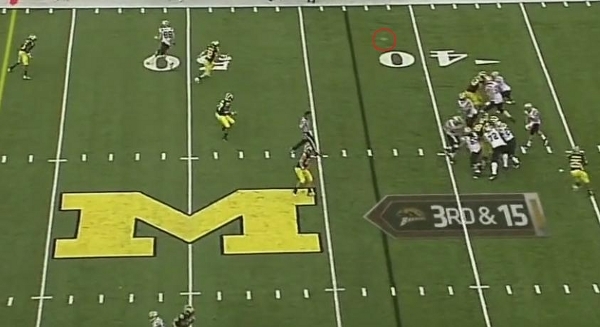 As the ball is snapped, Martin, Jones, and Kovacs drop into underneath zone coverage. Demens, Ryan, and Roh will run the stunt blitz on the strongside of the field. 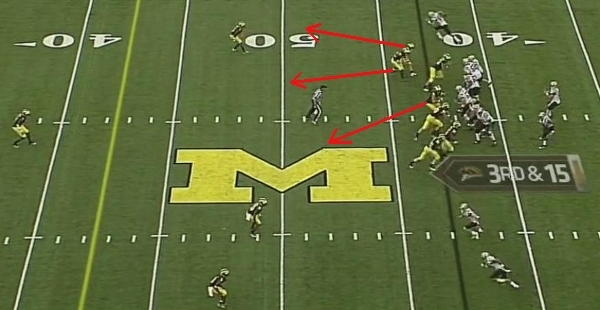 This time, the WMU running back has identified the blitz, as have the offensive linemen. We'll see in a second that they allow Demens to scream upfield while staying committed to the inside stunt. Kovacs is the boundary defender on the weakside of the field (top of the screen) with Courtney Avery responsible for coverage over the top. Jones and Martin are settling into underneath zone coverage. Meanwhile, on the defensive line, the right tackle has stayed home on the inside stunt and is engaged with Ryan (#90). Demens is shooting around the right tackle and trying to get to Carder. The WMU running is sneaking back inside help block Ryan. Despite blocking this marginally better, Demens will still have an unblocked lane to Carder. Carder has let go of the ball before realizing that Kovacs was dropping into underneath zone coverage. Kovacs has identified the ball (red) and is making a break to deflect the pass. Demens is running unblocked at Carder after the WMU running back abandoned his responsibility in order to double Jake Ryan who had stunted to the inside. Mattison baited the running back to do so with his previous playcalling. Here's the same moment from a different angle. 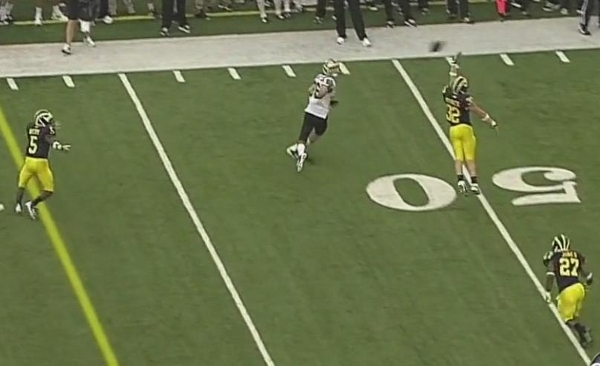 The WMU receiver has broken to the outside, but he's bracketed by Kovacs and Avery. 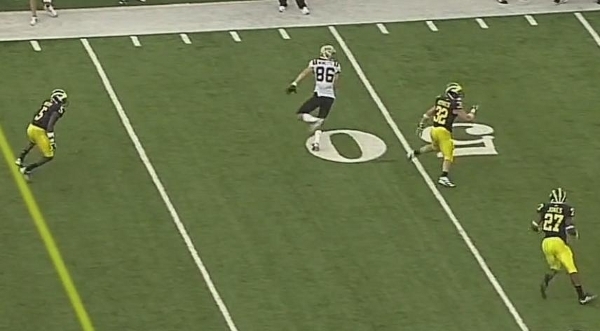 Kovacs defends this play well, but if one thing can be levied against him, it's that he was too far inside. Given the positioning and responsibilities of Mike Jones, Kovacs should be able to intercept basically any ball thrown to this route. Instead, he's simply able to deflect the pass, which, after the last three years, is a sight for sore eyes. Kovacs tips the pass but is probably just a hair inside. With more experience and time in the system, he'll understand how to maximize the design of this play and anticipate this thrown a little sooner. With any luck, he'll be able to pick off a few of these throughout the year. In just one game, you can already see the breadth of Mattison's schemes. All three of these plays feature essentially the same principles, but all of them have slight variations. Mattison : defense :: Rich Rodriguez : offense. By establishing a base of three or four effective foundational plays, Mattison can slowly bend and tweak the schemes in response to the opposition and force them into mistakes they don't know they're making. Chances are we won't see the full range of defensive tricks until sometime next year or beyond, but as the season progresses, it will be exciting to see what subtle adjustments the defense makes and how those impact the game. Good analysis, but you have the strong and weak side flipped. Kovacs and Jones are lined up to the strong side, just outside the TE, who stays in to block. This may be a call where the blitz automatically comes from the weak side, and you can see the reason why in this picture. Reading blitz, Carder changes the play to keep the TE in, to protect the direction that he's rolling, but all that accomplishes is to have a situation where three linemen are blocking one rusher, while Ryan and Demens get singled up. Good catch re: weakside/strongside. I always forget that when one TE is used, that becomes the strongside of the field. I'm fairly certain it's not only a weakside blitz, though. It's probably most effective then, but the first such blitz I diagrammed had Demens, Van Bergen, and Black blitzing/stunting on the strongside of the field. Unsound defense or blown coverage?